/ Modified mar 6, 2019 3:51 p.m. 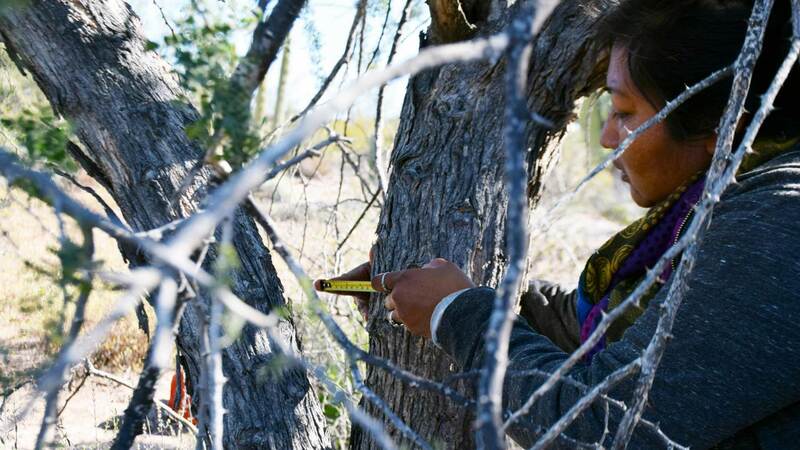 Researchers prepare to take measurements of ironwood trees near El Desemboque in Sonora, Mexico. There’s one thing that connects the more than 900 members of the binational group Next Generation Sonoran Desert Researchers, or NGen for short. “The region that we’re in here in the Sonoran Desert is immensely beautiful and mesmerizing," said Ben Wilder, NGen director. Indigenous ecologist Mayra Estrella called it "a special place." "It’s a treasure for humanity," said social anthropologist and marine biologist Michelle Early. 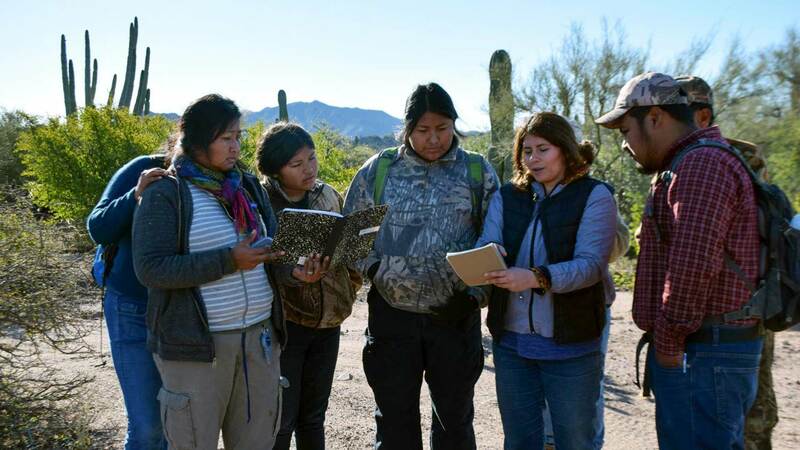 These researchers are tied together by their passion for the Sonoran Desert. They all work in its expansive mountain ranges and vast deserts that stretch through Arizona and California, down to the Sea of Cortez in northern Mexico. 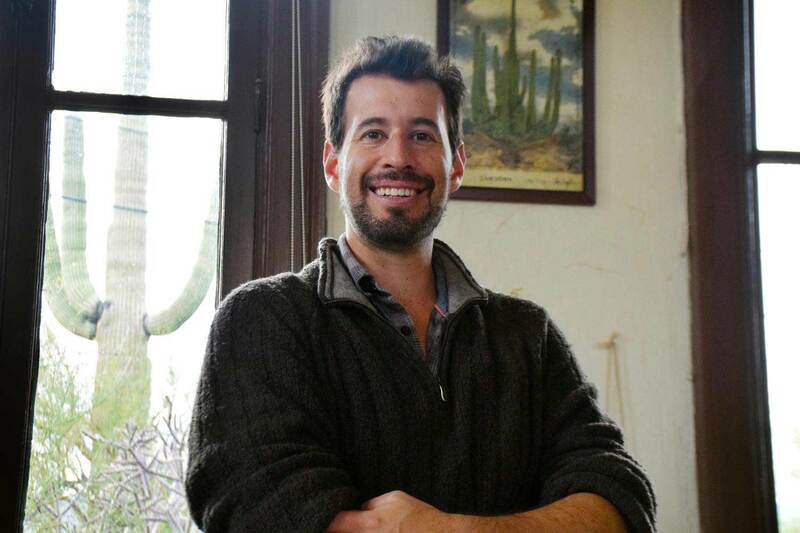 VIEW LARGER Ben Wilder, director of Next Generation Sonoran Desert Researchers, in his office at the University of Arizona Desert Laboratory on Tumamoc Hill in Tucson. NGen was created almost nine years ago to bring together young researchers committed and passionate about studying this region, said Wilder. And to tackle conservation challenges like climate change, mega-development or a border wall with a different approach to research. “The approaches that we’ve taken to science, to conservation — we’re losing a lot of battles right now," he said. So NGen is trying new things, like combining art and science and reaching across academic disciplines. One example: a pair of habitat conservation projects in a small indigenous village of the Comcaac people, often called Seris, on Mexico’s Sea of Cortez. On a recent Saturday, researchers packed their cars in the little fishing village of El Desemboque, then took off on narrow dirt roads, leaving the sea and the town’s simple flat-roofed stucco houses behind as they bumped and rattled into the desert wilderness of the surrounding mountains. Local Comcaac ecologist Mayra Estrella is leading a study out here about the health of ironwood, mesquite and mangrove trees. Because these trees, especially the ironwood, are sacred, she said. "It's really sacred to me, and for the community," she said. "It a story, a history." In the Comcaac community, ironwood is used in traditional medicine, for shade, firewood and intricate figurine carvings. 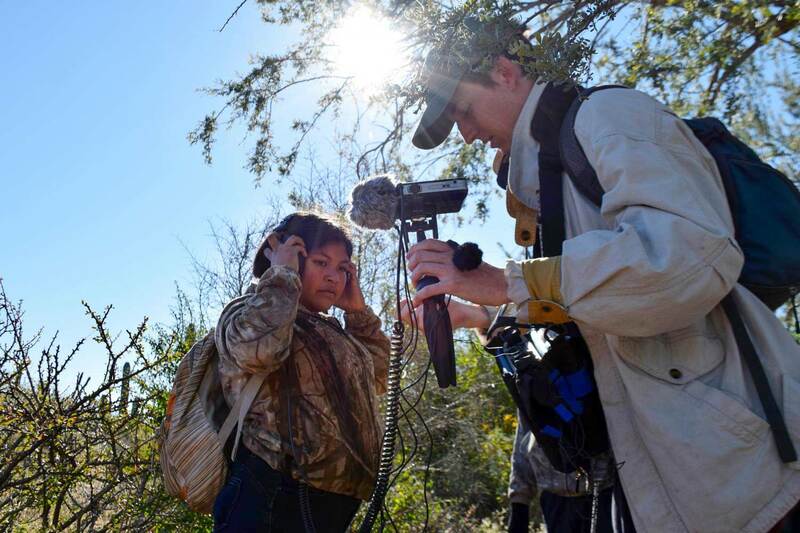 And while Estrella and her team measured the trees and documents the species diversity around them, acoustic-ecologist-in-training David Dearmore collected sounds in the same environment. He tucked small microphones into the crevices of trees to record them creaking and swaying in the wind. Then he arranged them on a cactus, showing two Comcaac students how to pluck and play the thorns to make different sounds. VIEW LARGER David Dearmore, right, shows student Dulce how to use recording equipment. Dearmore’s also drawing on indigenous knowledge, recording Comcaac traditional songs. Nested beneath the branches of a large ironwood tree to escape the wind, he knelt in front of Estrella, who sang a song to the mesquite tree. Then arranged the mics to pick up the voice of village elder Manuel Montoy, a tall, lanky man dressed from head to toe in slightly mismatched camouflage. As he sangs an ancestral song about the connection between humans and nature, the creases around his eyes deepened into a smile. But for Dearmore, a 20-year-old who’s not in college, it’s hard to get support for his work, he said. “You don’t see a lot of groups that are specifically focused on helping young people out without some sort of attachment to college," he said. But NGen is the exception, awarding him a grant for his acoustic ecology project in El Desemboque. NGen wants to give people from different backgrounds an equal place at the table, she said. It’s that network of shared knowledge and perspectives that gives NGen its strength.